During the lead-up and in the aftermath of last year's overthrow of democratically elected Brazilian president Dilma Rousseff, several writings appeared in progressive English language publications analyzing the state of the Brazilian left. Most of them were written by members of the white middle class, based on little or no contact with the Brazilian organized left which, as a recent article in NACLA mentioned, is a long-standing problem with Northern American analysis on Latin America. In an attempt to go beyond more of the same, my next four contributions to COHA's Brazil Unit were interviews with key figures of the Brazilian organized left: a national urban social movement leader, a union federation leader, a renowned radical-left intellectual and a national leader of the Movimento dos Trabalhadores Rurais Sem Terra (Landless Workers' Movement, MST). This article represents a systematization of the interviews and original analysis from the standpoint of an American who has lived in Brazil for 22 years and who has worked with the MST and the four largest Brazilian social movements. For clarity's sake I will add that the I am not affiliated with any political party and that I supported Partido dos Trabalhadores (Workers' Party, PT) candidate Lula in 2002, Partido Socialismo e Liberdade (Socialist Liberty Party, PSOL) candidate Heloisa Helena in 2006, PSOL candidate Plinio Arruda in 2010, and PT candidate Dilma Rousseff in 2014. The interviews were based on questions about changes in the political economy, last year's soft coup, and what the left is doing to alter the current state of affairs. There is no doubt that the so-called "Pink Tide" of radical and center-left governments that spread throughout the region under the George W. Bush administration is being pushed back, supported by international capital and the U.S. government. While many members of the Organization of American States (OAS) did not initially recognize coup governments in Honduras, Paraguay, and Brazil, the quick assent that came from Washington afforded them international legitimization. The rise of ultra-neoliberal governments is a continent-wide phenomenon that is not limited to Brazil and not primarily a result of the "people's frustration with corruption," which seems to be the new U.S. tactic for slandering democratically elected governments with the collapse of moral authority on human rights issues and torture. The current Brazilian government -- which is privatizing petroleum, eliminating energy self-sufficiency and rolling back decades of gains in women's, Afro-Brazilian, environmental, indigenous, small farmers', and labor rights -- is more a result of conservatives' inability to win four consecutive democratic presidential elections than any kind of perceived "failure of the left." Illegitimate president Michel Temer's PMDB party (Partido de Movimento Democratico Brasileiro, Brazilian Democratic Movement Party) has never actually won a presidential election, taking power three times though impeachments or the sudden death of a president-elect. The fact that it is back in power in Brazil, with an extremely corrupt government, cannot in any way be considered a victory in the fight against corruption. There is a strong consensus among the Brazilian organized left that a coup took place last year, and the body of supporting evidence for this claim continues to grow. On October 17, for example, the newspaper Folha de São Paulo revealed that impeachment architect, congressional president Eduardo Cunha (who is currently in jail for receiving millions of dollars in bribes from the private sector) received additional funding from a prominent stock broker and paid it out to members of Congress in exchange for votes to impeach Dilma Rousseff. Regardless of the evidence, major Northern media outlets worked to legitimize the illegal 2016 impeachment process from start to finish. Even so-called "liberal" commercial publications such as the New York Times and The Guardian ran articles justifying the legality of the impeachment process despite the fact that fiscal peddling, the accusation that triggered the impeachment, which Rousseff was later declared innocent of, is not an impeachable offense in Brazil. As Gegê da Silva, national leader of the Central de Movimentos Populares (Popular Movements Central, CMP), says, "There is not a shadow of a doubt that what happened in Brazil was a coup. And it's a coup that continues to be enacted on a daily basis on the backs of the working class." In order to understand present resistance to the coup government, it is important to look at how changes in the political economy have both weakened workers' ability to organize and weakened elite support for a nationalist development project. As MST leader Gilmar Mauro says, there are structural changes underway in the world political economy that are eroding the left's traditional organizational tactics and there is a growing segment of workers that no longer has space within the capitalist labor structure.xxiii Douglas Izzo, São Paulo president of the Central Única dos Trabalhadores union federation (Unified Workers Central, CUT), observes that robotics and computerization caused the number of factory and other historically unionized Brazilian jobs such as bank tellers to plummet. In the early 1980s, the CUT had 18 million members. Today it has 8 million, while productive output of industries like metallurgy has increased. Even traditional jobs in the service sector are disappearing. As the MST's Gilmar Mauro says, "today the largest taxi company in the world doesn't own one car. The largest hotel company in the world doesn't own one room." There is a huge increase in autonomous workers who receive no benefits or job security in Brazil thanks to companies like Uber, a situation that will be vastly exacerbated due to Michel Temer's draconian labor rights reforms. Consequently, the traditional left tactic of the strike is losing force. 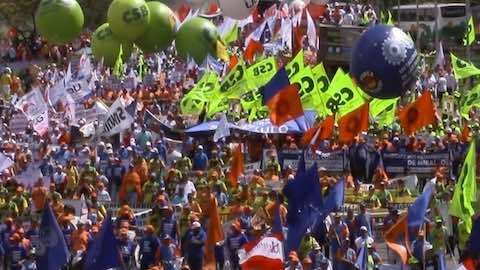 Although the largest general strike in Latin America this century took place in Brazil on April 28 with around 35 million participants , it did not succeed in halting the labor law reforms. The two PT governments attempted to balance supporting neoliberal central bank policies of their predecessors while implementing developmentalist policies such as minimum wage increases and subsidies for internal industrial production, consumption, and other key sectors of the economy such as the construction industry. In doing so, Lula bet on a strong petit-bourgeois national business elite. Key businesses controlled by this class in the petroleum, shipbuilding, and construction industries were completely paralyzed during the Lava Jato investigation, causing the Brazilian economy to implode, with some economists estimating that the recession was 300% deeper than it would have been without Lava Jato. Economic activities in Brazil's largest companies were paralyzed and its owners, unlike most politicians involved, were systematically jailed until they agreed to plea bargain their way out (represented at times by prosecutor and Lava Jato judge Sergio Moro's wife's law firm). Meanwhile, Northern capital flooded into these sectors, parts of which are now controlled by parties who have no vested interest in Brazil. As Erminia Maricato says, "the cycle of a strong nationalist business class has come to an end." In order to understand what the MST, CMP, CUT, and left intellectuals are doing to fight against the coup government and the socio-economic setbacks incurred during the past year, some historical context is required. During the U.S.-supported military dictatorship (1964-1985), the liberation theology movement fomented working class democratic resistance through nation-wide political organizing in favelas, working class neighborhoods, and poor rural communities through its catholic ecclesiastical base communities. Its Paulo Freire-influenced critical adult literacy methodology was key in the formation of the MST, as well as many other major Brazilian social movements. Then the Church, under the leadership of Cardinal Joseph Ratzinger, punished world-renowned liberation theologians like Leonardo Boff and decimated funding for political organizing. The vacuum caused by vanished church support resulted in a greatly strengthened evangelical Christian right, especially in poor neighborhoods, in turn resulting in an aging social movement membership and leadership. The social movements were further weakened by their bureaucratization through a series of government programs to support them during the Lula and Rousseff presidencies. Misunderstandings about the current political context are exacerbated by the tiny PSOL party and its Northern academic fans, who have built a myth that Brazilians are furious with the PT party for its "betrayal." Although moderately large in Rio de Janeiro and São Paulo the PSOL is practically nonexistent elsewhere. Its candidate, Luciana Genro, achieved 1.5% of the vote in the 2014 presidential elections and only managed to come in fifth place in last year's mayoral race in her hometown of Porto Alegre. When the party first formed in 2005, it appeared to have a promising future. In 2006 PSOL candidate Heloisa Helena got 7% of the vote in the first round of the presidential elections but since then the party has failed to muster 2% and it only controls two small-town mayor's offices nationwide. If Guilerme Boulos runs for office next year on the PSOL ticket, as many people think, it is highly doubtful that a huge surge in support due to "the left's frustration with the PT party" will carry him above even 2%. The PSOL is full of radical academics who provide coherent criticism of its traditional congressional ally the PT. This criticism is important, and there is plenty to complain about. But basing analysis of Brazilian politics or the Brazilian left exclusively on analysis from PSOL activists, as some leftist northern writers and publications seem to do, would be tantamount to generating political analysis in the United States in 2016 based exclusively on the Green Party without listening to any Bernie Sanders supporters. In an atmosphere in which grassroots organizing and other traditional leftist tactics such as strikes and street protests were weakened and no viable alternative to the PT party emerged, the organized left created two inter-related civil society coalitions, the Frente Brasil Popular (Popular Brazil Front, FBP) and the Frente do Povo sem Medo (Fearless People's Front). Starting during the lead-up to the coup, these groups worked together to stage large street protests and two general strikes. Although some people try to divide them along ideological lines, the largest civil society organizations in both movements are the same: the CUT and the MST. In May, they worked together to organize the largest protest in Brasilia's history, which brought over 200,000 people to the streets and resulted in Congressional president Rodrigo Maia temporarily declaring martial law. Maia represents the neo-fascist Democratas party (Democrats, DEM), which is a direct descendent of the military dictatorship, and he is next in line for the presidency should any of the seven accusations of multimillion dollar bribery, money laundering, and kickbacks result in Michel Temer's removal from office. His bungling response to the protest was a wake up call for many people and the prospect of putting an even worse politician than Temer in office has weakened protests calling for his removal and spurred organizers to begin focusing their attention on next year's presidential ballot. With the exception of the PSOL-affiliated São Paulo chapter of the Movimento de Trabalhadores Sem Teto social movement (Homeless Workers Movement/MTST), Lula is the favored candidate for all major left social movements and labor union federations for next year's presidential elections. Despite decades of persecution by the Brazilian media oligarchies and libelous social media campaigns, his lead in the polls has steadily increased since the coup. If Lula is allowed to run for office, he will be the clear winner. However, here lies the important question, because his candidacy is currently blocked by U.S.-backed judge and prosecutor Sergio Moro due to flimsy accusations that Lula received illegal reforms on a luxury apartment in Guaruja that the court was unable to prove he either owned or ever set foot in. Although Sergio Moro has been hailed as an anti-corruption crusader in the hegemonic Brazilian and international press, he continually refuses to prosecute anyone in the conservative opposition PSDB Party, including 2014 presidential runner-up Aécio Neves, who has been caught on video and audio tape soliciting and receiving millions of dollars of bribes from the private sector. This is suspicious because Moro's father was a PSDB party founder in Parana and his wife is a member of the PSDB party. If Lula is not allowed to run, the next most popular candidate is the white-supremacist, misogynist holdover from the Military Dictatorship, Jair Bolsonaro, who recently made a campaign tour in the United States to soften his international image with some support from the corporate think-tank AS/COA. In conclusion the vast majority of the organized Brazilian left, including the CUT labor union federation and the largest urban and rural social movements believe the PT is the only party that currently has a feasible plan to retake the Brazilian government and undo the damage that was done to human rights, the environment, national autonomy and the public health and education systems over the past year. This vast popular support for Lula, represented in the election poll numbers, seems to represent a pragmatic choice due to a difficult political and economic scenario in which all other viable candidates for the presidency range from ultra-neoliberal to neofascist. However, the fact that the organized left continues to support Lula should not be ignored or downplayed by people who are trying to understand the current political context in Brazil. Furthermore, suggestions from northerners for the Brazilian left to abandon the PT party at a time when it could benefit from solidarity, are, as the four interviews this article was based on make perfectly clear, both ignorant of the current political context and not particularly helpful. Article: Courtesy Council on Hemispheric Affairs. Latin America: "The State of the Brazilian Left"